This is a beautiful choice for lovers of the seashore, worth picking up for the photos alone. Featuring 43 of the 350 lighthouses on the Great Lakes, it includes interesting stories of wrecks and rescues, lights and lighthouse keepers--some of whom had to climb to the top of a 98-foot tower every six hours to fuel the light with kerosene. A young Indian boy carves a canoe and travels through the Great Lakes to the Atlantic Ocean. The text and pictures provide an excellent geographical and historical picture of the region. Caldecott Honor Book. 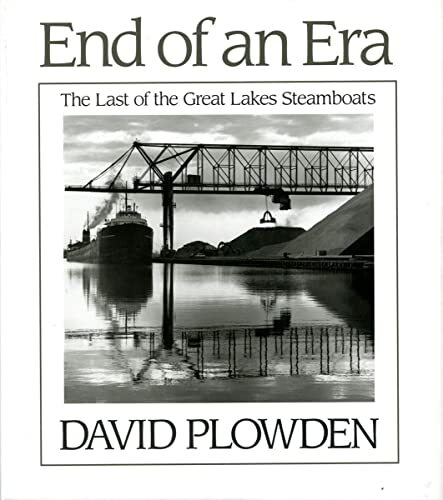 David Plowden has spent many hours sailing aboard older Great Lakes Steamships. His goal was to capture the essence and emotion of this unique type of steam vessel. The days of the the reciprocating steam engine aboard commercial frieght ships has come and gone just like the old venerable steam locomotives. The beautiful black and white photographs, coupled with an insightful narrative, gives the reader the most realistic vision of an era which will never again be experienced in human history. When David set out to do this project, he sensed the urgency of his mission. Today, most all of these vessels have been retired or scrapped and will never again feel the the seas, or the warmth and love of thier the crews. I have personally observed David as he stolled about our decks with great love and devotion for these ships. This book is a culmination of that love. This artists goal, to capture these vessels as they lived and breathed, has been majestically fulfilled. It is a must for anyone with interest into the daily workings of steamships, steam engines, and the people who lived among them. This book truly captures an "End of an Era".